When I read this quote it perfectly encompasses how I feel about my life right now and where I should be the next few years of my life. I realize I need to become my own person. I need to learn to take care of myself before I can have someone else taking care of me. I need to focus on myself, and furthering the person that I want to become. This doesn't have to just be pertaining to guys, it's your parents and friends too. You don't need your parents to be giving you money; go earn your own. You don't need your friends to dictate what college you go too. Otherwise, your going to have difficulty when one of these things goes away. 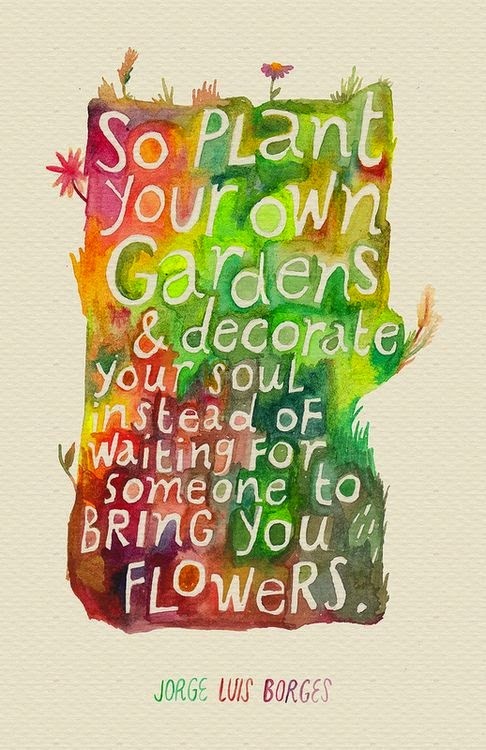 As the quote suggests you should plant your own garden, because that garden will come back again and again,always providing you with fresh flowers, while when someone brings you flowers they last for only a little while. You are the only one who is there for you, for ever without fault. 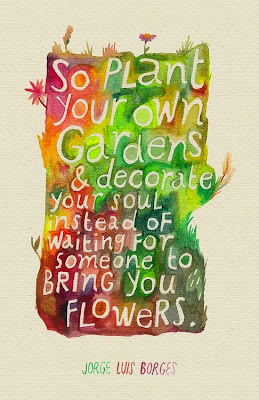 Yes, fill your house with bouquets of flowers, but only after you have planted your everlasting garden, so even when the bouquets die you will have something to fall back on. Never base a major life decision(college, job, where to move, what to do) on anything but what you want to do and what will grant you the greatest success especially when you are young. Be yourself and go out and chase your dreams.